Whether it’s a romantic date or just another Friday night, Atmosphere 6 is one of the plush lounges in Viman Nagar with an entire view of the city skyline. 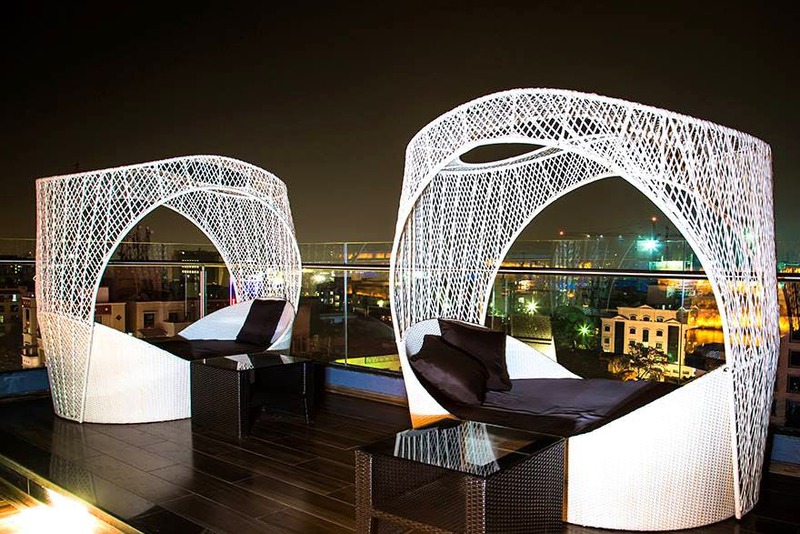 Located at Lunkad Skymax in Viman Nagar, Atmosphere 6 is a spectacular rooftop lounge with cocoon chairs, illuminated floors and gorgeous side lamps to set the mood. The place also has an indoor seating which is beautifully decked up to complement the open-air ambience. The food menu is quite extensive and has a great balance of Indian, Continental and Oriental cuisines. We, however, preferred to go for a scrumptious Mughlai spread and loved their chicken Malvani kebab, kadai paneer and bhuna gosht. We complimented the dishes with lal mirchi kaa parantha and jeera rice. If you can’t handle spice, we recommend you go for either butter or garlic naan. We ended the meal on a sweet note with a slice of their decadent banoffee pie. Although we didn’t go for any cocktails, we have heard rather rave reviews about Atmosphere 6’s special cocktails. Must try their classic monk’s habit which is a concoction of gin, hazelnut and pineapple syrup, grenadine and butterscotch ice cream.